O Glorious St. Joseph, model of all those who are devoted to labor, obtain for me the grace to work conscientiously, putting the call of duty above my natural inclinations, to work with gratitude and joy, in a spirit of penance for the remission of my sins, considering it an honor to employ and develop by means of labor the gifts received from God, to work with order, peace, moderation and patience, without ever shrinking from weariness and difficulties, to work above all with purity of intention and detachment from self, having always death before my eyes and the account that I must render of time lost, of talents wasted, of good omitted, of vain complacency in success, so fatal to the work of God. All for Jesus, all through Mary, all after thine example, O Patriarch, St. Joseph. Such shall be my watch-word in life and in death. Once St. Joseph has helped you in either manner publish his name in gratitude either in a local newspaper or on an internet forum. Other fun facts about St. Joseph: His feast date is March 19th every year. He is patron of real estate, home selling and buying, carpenters, workers, engineers, craftsman, fathers, unborn children, and a “happy death”. 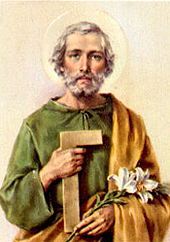 According to the Roman Catholic Church his figure St. Joseph the Worker has a feast date as May 1st. When trying to sell a home bury a St. Joseph statue upside down in the yard on the property to be sold, use a 9 day novena to pray to the saint, after the sale of the home, dig up the statue and put in your new house on display to pay homage to his intercession.